Making good screens is not rocket science. It isn’t difficult or outrageously expensive. Sometimes taking shortcuts can make it every time consuming and costly. Focus time and attention on the areas discussed next and you will experience consistent/ predictable results, better image quality and longer lasting screens. There are several things to consider when you are selecting a screen frame: construction, mesh type, mesh color, tension of the mesh and durability. 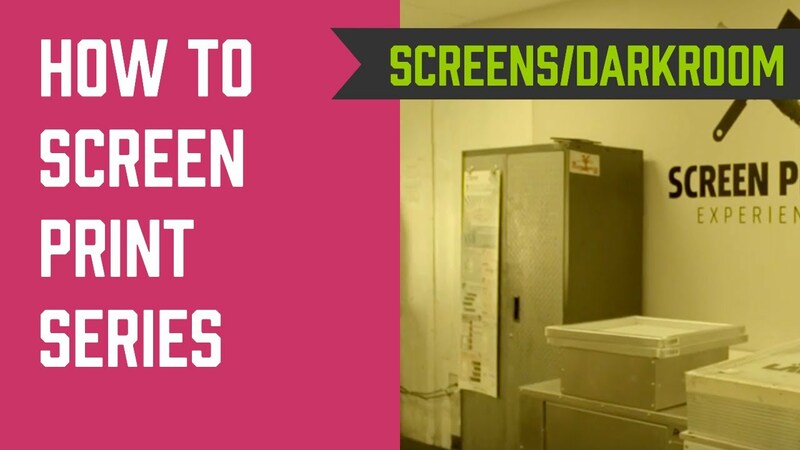 There are two types of screens: static and roller, they both have their place! A static screen means that the mesh is stretched to a frame and does not move once it is stretched. A screen is actually stretched by a pneumatic ram that pulls the mesh extremely tight across the frame. Once it is stretched it is glued down and chemically locked to the frame. A roller frame moves and creates its own tension by tightening the mesh as the roller moves away from the mesh. The mesh is locked into the roller frame using locking strips. In our classes and with our beginning screen printing packages we typically discuss static frames. Static frames cost much less and are very easy to use. Roller frames give you a high tension screen and allow you the ability to re stretch the screen manually. However, they are more expensive and you have to learn how to properly stretch them. Wood vs. Aluminum Wood screens are naturally made. Since wood is less expensive then aluminum they also cost less. However, during the screen printing process there is a lot of moisture and different products involved. Degreasing with water, printing with wet ink, cleaning the screen with chemicals, reclaiming and dehazing. It’s common knowledge that when wood gets wet, it warps. The advantage of an aluminum frame is that it will not warp; it will remain structurally sound much longer and is worth the extra cost! More About Aluminum Frames As stated, the advantage of an aluminum frame is the durability and longevity it retains. Unlike wood frames, when repeatedly exposing frames to water in a dip tank or washout sink aluminum frames will not warp. This will ensure a flat frame for literally thousands of prints. Aluminum frames can also be stretched and re stretched many times. The mesh and glue are simply removed from the frame using a professional tool that doesn’t damage the aluminum. Once cleaned, the frames can be re stretched which will give you the ability to use that frame for many years of work in your shop. Aluminum frames are also lightweight, which makes shipping less expensive, saving you money in the long run. If you’re looking to maximize performance in your shop aluminum frames are excellent items to add to your screen printing equipment. Visit Ryonet's Blog to read the article below ***led "Mesh Count and You to learn more about the different mesh counts for screen printing.